If you’re looking to use VMware NSX’s Guest Introspection feature, you’re going to need the Guest Introspection Thin Agent component installed with VMware Tools. This feature is not installed by default, which requires going back and updating your VMware Tools installation. This feature was known as the VMware vShield Endpoint Thin Agent prior to the ESXi 5.5 Update 2 release, which is when VMware renamed it the VMware Tools Guest Introspection plugin (source). 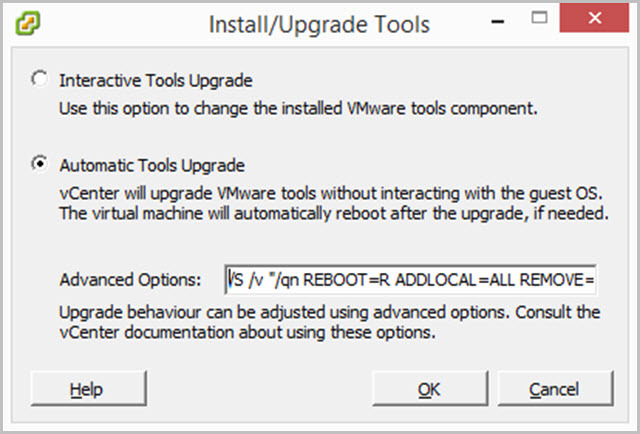 This post contains one simple way to do the VMware Tools upgrade based on my Avoiding Those Pesky Reboots when Updating VMware Tools post from years back. 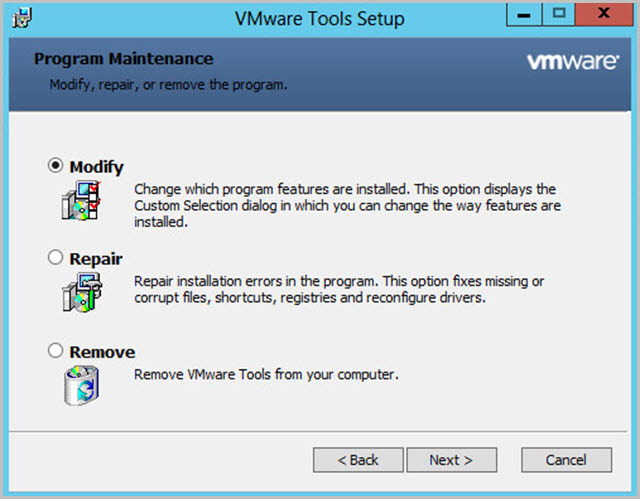 If you’re not sure if the feature is installed, open up the Programs and Features portion of the Control Panel and find VMware Tools in the Uninstall menu. 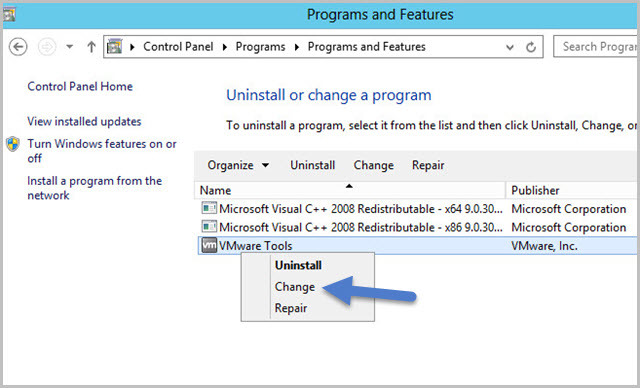 Rather than choosing uninstall, select Change. The Program Maintenance window will appear. Select Modify. From here you can inspect which features have been installed. Below is a default installation on a Windows 2012 server. 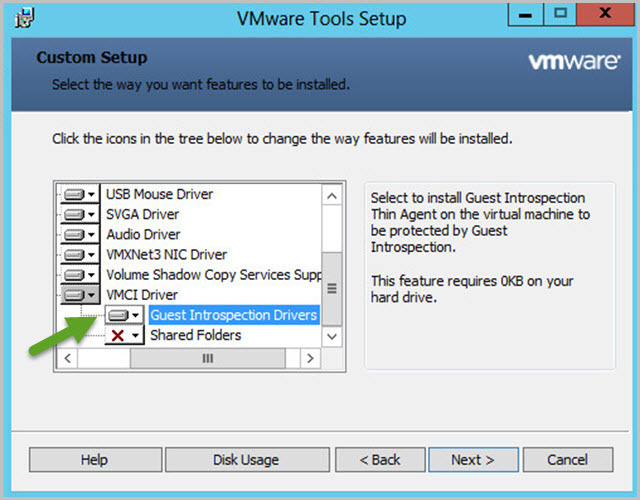 Note that Guest Introspection Drivers and Shared Folders are not installed. The “secret” feature names for these are VShield and HGFS, respectively. If you’re looking to fix one server, this method would suffice. But that’s no fun! Let’s install Guest Introspection to a bunch of VMs, easily. /S /v "/qn REBOOT=R ADDLOCAL=ALL REMOVE=Hgfs"
Tip: Here’s what all of those funky switches do. The first two arguments are for the InstallShield application, setup.exe. /S requests a silent installer, and /v lets the application know that you’re going to pass switches directly to the MSI. This is why the command structure after the /v is enclosed in double quotes. The /qn portion is MSI-speak for no user interface, while the REBOOT=R portion is to ReallySupress the reboot. ADDLOCAL is describing what features to install locally, while REMOVE states to toss out the HGFS (Shared Folders) feature. This way ensures that new features will be added without having to call them all out in a list. If you trigger an automatic tools upgrade via the vSphere Client, you can paste this string into the advanced options box. Doing so will trigger a VMware Tools install for the missing feature(s) and display a new Initiated VMware Tools install or upgrade task for the VMs you selected. The process took about 10 seconds on my Windows Server 2012 VM. Once completed, the missing feature is now installed. Note that you can also use a script that calls the setup.exe installer, or just bake this into your template / bootstrap process. Thanks for the information. We ran into an issue a few months back where it would brick the VMs network settings and we would have to reset them manually. I will be sure to test this on a couple of test machines to see if it solves our issue. Good hint for previous named vShield component. Any hints for this feature on linux VMs? Thx for the post, great command to update the VMware tools and to avoid the reboot ! Helpful post for VMware tools!! Question Chris: after using the “no reboot” option, the VMware tools get installed, but arent we still needing a reboot after? I know that the command works and installs the drivers, but usually Windows always requires a reboot after new device install. Yes, this just delays the reboot but one will be required at some point. what if you just want to add the NSX introspection driver and nothing else?